FlipEZ™ | Jonco Die Company Inc.
FlipEZ™ is a patented high speed scrap ejection system for rotary cutting dies. It enhances stripping performance on rotary die cutters by discharging the scrap away from the blank, reducing or eliminating scrap issues that can jam your machines and shut down your production lines. It works on hard to strip areas such as internal windows and small cutouts. 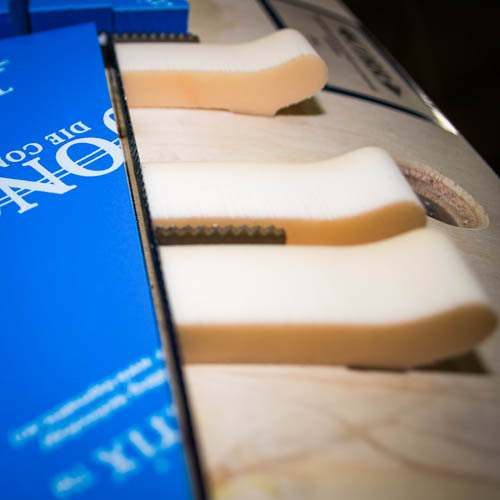 Requiring no adhesive, FlipEZ™ is also very easy for you to replace. Just snap out the damaged piece, snap in the replacement piece, and resume your run.